Chatting with Becky & Cori about their new store, All the Dogs, on Church Street. So, what are you roles, and how do you know each other? 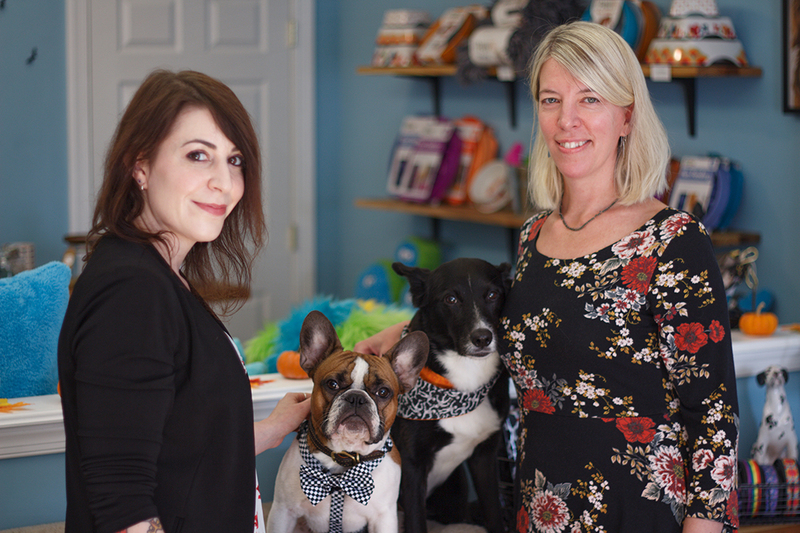 BECKY: I am the Founder & Owner of All the Dogs, and Cori is the Co-creator and Operations Manager. We have known each other our entire lives; we’re cousins. Can you introduce us to your pups? B: His name is Cody. He’s one of my three French Bulldogs who served as the inspiration for our logo. Cody makes an appearance periodically, but usually it’s Cori’s pup, Miles, who is the Shop Ambassador. Why did you think West Chester was the right fit for a pet store? B: I wanted to work with dogs in some capacity, with-out getting too attached. Opening a small shop in my hometown seemed like a great opportunity to work in the dog world. Downtown West Chester hasn’t had a dog shop in several years, and I saw a need to bring one to the borough; this town is booming with dogs! What prompted your on focus on healthy, high-quality and local items? CORI: We’re both incredibly conscious about the health and well-being of our pups, the importance of community and the impact of production on our environment. Before the shop opened, we were challenged with finding treats and gear locally that met our standards. Can you tell me about some of the more exciting products you keep in stock? B: They change weekly, as my pups try every new product in the shop! Right now they’re enjoying West Paw’s Fergus (a durable stuffed squeaky toy that looks like Gritty, the Flyers new mascot). C: And puzzles! We have several lines of puzzles to promote mental stimulation and independent entertainment. What do you find motivates your customers? C: Much of the dialogue we share with customers centers on the health of their dog. Our customers inform us of challenges they’ve had with certain food sensitivities and environmental allergens. We hear about dogs that need collars/harnesses that are hypoallergenic to eliminate skin irritations, and so many other things. We’re happy to offer several lines of treats, gear, toys and skincare to support their health. Is this is a growing market? C: Caring for Miles holistically, today, is much easier than it was nine years ago when he came into my life. The availability of products has grown exponentially over the years, and I expect this trend will continue. I don’t see the demand for high-quality, sustainably sourced, non-toxic products to diminish. What have been some of your favorite customer experiences? B&C: Any time a dog walks through the door is our favorite experience. The best part of this business is meeting, petting and treating all the dogs! If your dog could talk, what we he want other animals to know? CODY: Come to All the Dogs! We have so many fun toys and yummy treats! MILES: Every time you come in, you get a treat, and that means I get a treat, too! Please visit so we all get more treats!